Image shows the ultra-high vacuum target chamber used in the experiment. Credit: David Cassidy, UC Riverside. Positronium is a short-lived system in which an electron and its anti-particle are bound together. 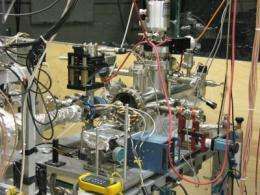 In 2007, physicists at the University of California, Riverside created molecular positronium, a brand-new substance, in the laboratory. Now they have succeeded in isolating for the first time a sample of spin polarized positronium atoms. Cassidy explained that positronium atoms come in two types - say, an up type and a down type. The positronium atoms are only annihilated when an up type meets a down type. Two atoms of the same type do not affect each other. "So if you have 50 percent ups and 50 percent downs and you squeeze them all together they will totally annihilate and turn into gamma rays," he said. "But if you have, for example, about 66 percent ups and 33 percent downs, then only half of the ups will be destroyed. You will get a load of gamma rays - but in the end you will be left with only one type of atom - in this case, up atoms. I don't see how one collimates radiation the wavelength of which is less than the diameter an atom. What the hell is Positronium. Someone provide details on how electrons and positrons can be bound together? The gamma rays emitted by a group of positronium atoms stimulate the annihilation of other atoms in a wave, causing a narrow beam of gamma rays to emitted from the far edge. 142ns is actually quite a long time compared to the lifetime of para-positronium. If you watch the movie "Avatar", you'll get the idea. When you remove almost all kinetic energy from the particles they can become bound through other force interactions, strong and weak nuclear force, etc. As Alizee pointed out, the timescales for existence are incredibly small, however, the research above is attempting to lengthen that timescale for existence by ultracooling thereby removing all velocity and allowing from extended existence. I'm sure this new research will produce beneficial fusion power, just as space solar power satellites will beam down high intensity microwaves to supply us with cheap energy from space. Instead both projects will be converted into weapons of mass destruction by USA defense contractors, exactly as David Kagan wrote about in his best-selling book Sunstroke regarding SSP. And? This is obvious to most anyone. It all started with Prometheus. You have heard of fire? Arch-type and all that, wot, wot? I wonder how much positronium can be be put into something the size of a bullet. That could make for one bitchen anti tank weapon. I wonder how much positronium can be be put into something the size of a bullet. I see, a millitary guy...;-\ Well, a grain of 100% antimatter should be enough - why to dilute it by some electrons and make it unstable in such way..? Why does "fusion power" matters here? We can capture that energy release. Meaning the fuel would have an E value of 1. Our only losses would be in transmission and capture. Particle antiparticle annihilation is one manner of "fusion" research. In reality the term to be used was nuclear, not fusion. Fusion power cannot be achieved from annihilation, that would be a different power source. Fusion power comes from fusing atoms into a different atom. matter/anti-matter power would be much better power than fusion power in the sense that it would have less byproducts. +ve + -ve = E whereas with fusion you have atom + atom = bigger atom + E.
How do they make the anti-particles in the first place? I was under the impression that the process was so energy intensive to do this, that the payback from anti-matter annihilation would not be worthwhile? It doesn't. I Has Cheezburger. Ostentatious method involving laser to produce fusion power, I think it is superfluous. Electrostatic acceleration, when wisely used, can be much more efficient, consuming much less energy. Science is great! Such vigorous discussion! Makes the mind boggle, doesn't it? does it not seem ludicrous that cosmologists can propose that extreme low-density dust clouds can simply collapse into themselves and form fusion engines known as stars? Not if you understand Boyle's Law, typically taught to 4th graders.